This pouch is super easy and fairly fast to make. 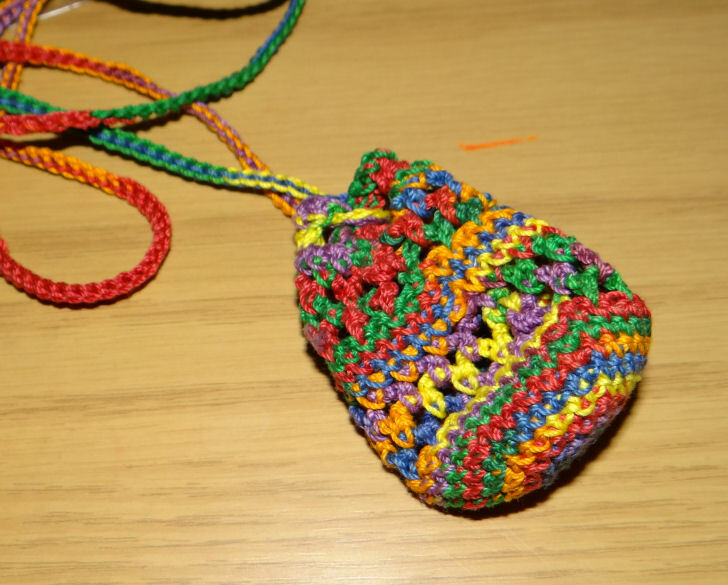 It uses single crochet, chain and double crochet stitches. The small pouch can be used to hold rocks and crystals, or with a smaller chain- used as a gift bag for a ring or piece of jewelry. Rnd 7-9: Ch 1 tightly (does not count as first sc), sc in each st around, sl st to join. Rnd 11: Ch 1 tightly (does not count as first sc), sc in top of loop, *ch 3, sc in next loop*, repeat ** 16 times, ch 1, dc in first sc. Rnd 13: Ch 1 tightly (does not count as first sc), sc in top of loop, ch 1,* sc in next loop, ch 1*, repeat ** around, sl st to first sc to join. Rnd 14: Ch 1 tightly (does not count as first sc), sc in each st and space around, sl st to join. Rnd 16: Ch 1 tightly (does not count as first sc), sc in each st around. Chain a length long enough to slip over your neck, or 6 inches long if you are using it for a gift bag instead, sl st back down the length of the chain. Break off leaving ends long enough to weave in. Weave strap through the chain 3 spaces on Round 15, then tie off ends and weave them in. Thank you. That's one of my favorite thread colorways because it is so bright. There are some great videos on youtube to learn to crochet. It's a lot of fun.